Invisalign - Santa Monica Dentist - Yosi P. Behroozan, D.D.S. Our doctors are able to give you the beautiful straight teeth you’ve always wanted without the feel of bulky traditional braces. Through a series of invisible, removable, and comfortable plastic aligners, your teeth are methodically moved into orthodontically correct locations.The clear brace material enables patients to smile without being self conscious during treatment. The Invisalign system for teeth straightening has been proven effective in research and in orthodontic practices nationwide. The clear brace technology has become so much of a treatment standard that over 70% of U.S. Board Certified Orthodontists now provide it as a alternative treatment to traditional metal braces. • As you replace each aligner with the next in the series, your teeth will move – little by little, week by week – until they have straightened to the final position your dentist has prescribed. • You’ll visit your dentist about once every 6 weeks to ensure that your treatment is progressing as planned. 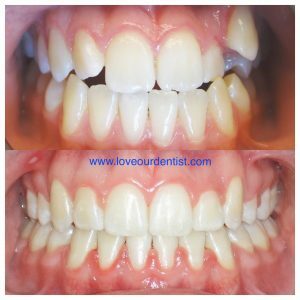 • Total treatment time averages 9-15 months and the average number of aligners worn during treatment is between 18 and 30, but both will vary from case to case. Invisalign uses advanced 3-D computer imaging technology to transform the bite impressions our doctors have made into a custom-made series of clear and removable brace – aligners. There may be as many as 48 in the series or as few as 12, depending on your individual treatment needs. We also offer traditional braces and will offer a free consultation to help determine which technique is ideal for you.